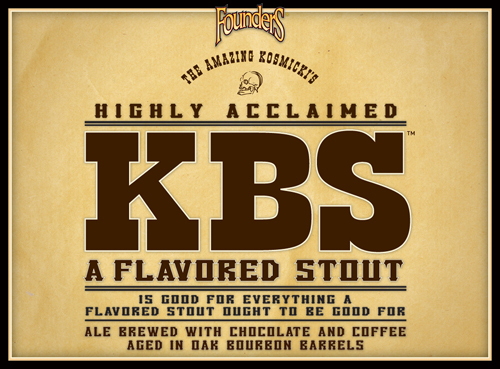 FOUNDERS KBS – KENTUCKY BREAKFAST STOUT is an American Imperial Stout with a hearty 11.2% ABV and a surprising 70 IBUs. The waiting has finally come to an end. The KBS bottle unleashed a deep brown liquid into my glass. No light penetration or carbonation could be seen within in the opaque brew. The head is no more than a wisp, but carbonation bubbles up in the middle like a tar pit, refreshing the head for several minutes. Lacing leaves slopping rings around the glass with each sip. My first sniff and I was hooked. Bourbon, wood, and molasses were the first thoughts that popped into my nose/brain. Notes of dark chocolate and bacon add even more “breakfast” notes to the table. You’ll think you’re actually smelling breakfast (especially if you’re a degenerate that drinks bourbon for breakfast). As the beer warms I detected hints of black pepper and coffee. Reserved is not a word I would have expected to use in regards to this beer, but it was one of the first thoughts I had. The nose was very boozy, but the bourbon was really only third tier in terms of flavor. It starts with cocoa and a touch of oak. Bourbon then comes in along with molasses and coffee (the coffee is much more pronounced in the taste than it was in the nose). It finishes with a chocolate milk flavor that smooths everything over and brings it all full circle. As it warms I picked up an interesting Almond Joy candy bar-like flavor. Mouthfeel is creamy and medium-to-thick. It goes down easily, but the bourbon gives you a nice little burn to remember it by. I’ve been hearing how good this beer was for a while now , but I was never back in the Midwest during its limited release schedule. Now that I have had the pleasure of trying it I am very glad that I did. Everything you want from an (American) Imperial Stout is present in this beer: chocolate, oak, bourbon, coffee, etc. etc. 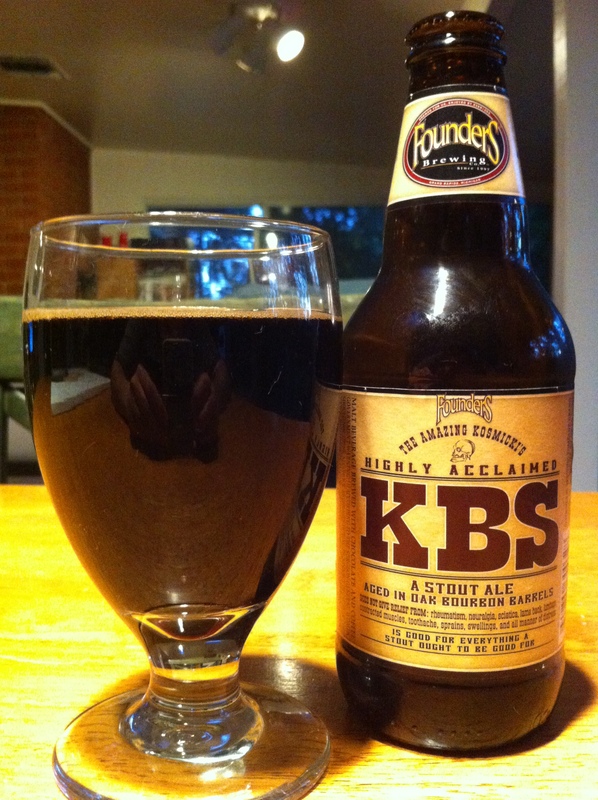 KBS is one of those great beers that lives up to both its name and its hype. This bottle had been aging for almost a year and I think this added more booziness, but I don’t think it detracted from the flavor or the drinking experience.